Why should children be introduced to music at a young age? development of cognitive skills is at the peak. The patterns of brain development have been noted at a higher level in the crucial period of a child’s life, making music a catalyst in this phase. 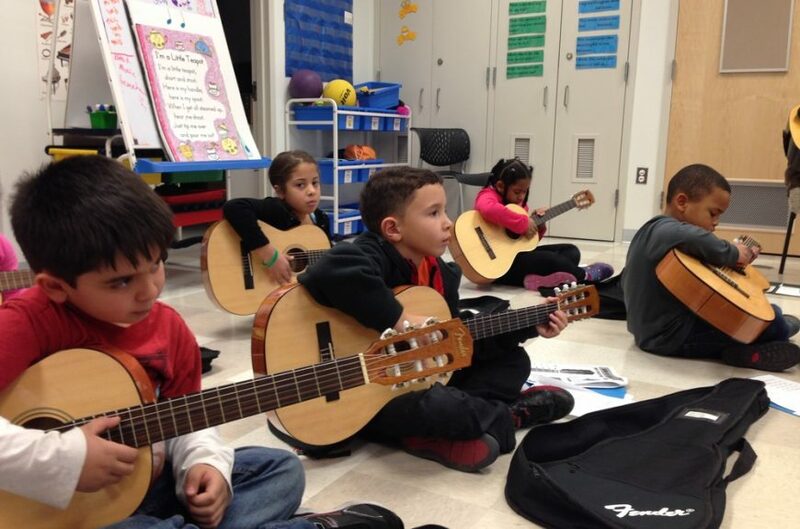 Learning a musical instrument makes a different sense of confidence in a child. Imagine how you feel when you achieve some goal, something that you put in a lot of effort for? That thrill, that instant confidence? That’s precisely what your child will feel when he learns a new song or a difficult chord! Music will prove to be the source of self-generated confidence for your child. Music is a language, and it is one which will help your child express! While some kids are vocal or can put forth what they feel in words in a better way, many kids are not. Music works best on these introvert kids, giving them a medium to express what they feel comfortably. Irrespective of age, every person in a music class is a student. So your child will have exposure to not only children of his age group but also with those older and younger to him. And everyone will have music as their common bond, which will help them to gel along better. The social skills which your child learns in the music class will be carried by him in the outside world too. Growing up we all do realize that patience is indeed a virtue. How if your child learns this right at the initial stages of his life? Well, music will bring into your child an increased level of patience that will help him not only in the music lessons but also in his life. I’m sure after knowing these facts you’ll enroll your child in a music class right away!